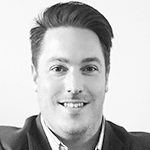 Is Your Brand Attracting Talent – Or Scaring Them Away? It’s 2017 and your employer brand should be high on the agenda. In today’s world, attracting and retaining top talent is an increasingly competitive arena. Suddenly, your location, salary, industry or even your job description might not be the only aspects that are preventing you from attracting the employees that will drive your business forward. Instead, you need to turn the focus inward and look at the brand, the values and the experience that the business is providing in order to compete with the ultra-modern businesses that are appearing in every city. Take a second to think about the type of employee that you want to be working within your business; excited, passionate and vibrant individuals that think ‘outside the box’? Or quiet, loyal and mindful staff that follow instructions well? Whatever the reality is, is your business also reflecting these traits? From the very first encounter that your candidates have with your business they should be able to grasp what your brand is all about; for instance, a dull, uninviting website or poorly written personality-free job advertisement is unlikely to attract innovative and high-energy employees. 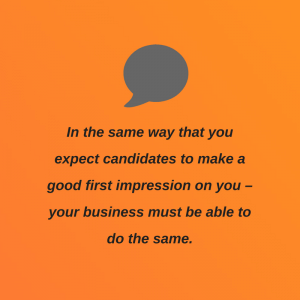 In the same way that you expect candidates to make a good first impression on you – your business must be able to do the same. While we are on the subject of websites, you must treat it in the same way that you would treat a ‘shop front’. It should be enticing and attractive, with content that reflects the true nature of your business – even if it isn’t the most exciting industry in the world. If you don’t allow yourself the opportunity to describe what it is that you and your staff do, you run the risk of people doing their own research and finding the truth out for themselves. However, the further risk from this is that it could be in the words of a disgruntled former employee or customer – damaging your brand and turning the candidate off when it comes to working for you. It’s likely these bad reviews and experiences will spread thick and fast. It’s vital that your brand is fresh, authentic and personable, otherwise you could be missing out on top talent that are looking for fulfilling careers, with them choosing your competitors instead. Your employees need to be treated as real people, with real emotions and lives outside of their working hours. Offering a role and an environment that allows them to excel in both their personal and professional lives is going to showcase your business as forward-thinking. A brand that invests in their employees is going to be rewarded with motivated, productive and local brand ambassadors – which in turn, will mean that people will clamour over each other to work for you. If you already have great employees – showcase them! Create a personality for your brand using your website and social media enables you to shine a spotlight on what it’s like to be a part of your business, the culture and values. Deloitte creates case studies of their employee’s to feature on their website that includes a roadmap of their progression through the company. If you are demanding candidates that only have specific qualifications, then you will deter others with an abundance of potential from applying. Is the criteria that you are asking for really necessary? If you narrow the margins for those too when it comes to applying, you may find that those who have applied have stretched the truth on their CV, they have an attitude that leaves a lot to be desired, or you feel would not be a good ‘culture fit’. 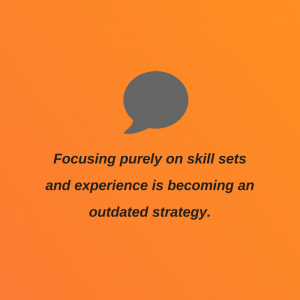 Keeping your demands less specific means that who could find an outstanding candidate that has less experience – a blank canvas, that can be educated to your standards? The attributes that should be sought after are vales and ethics that align with your brand along with a willingness to learn and progress. It’s vital that you don’t fall into the trap of believing that you don’t have to work hard to attract top talent – this is far from the truth. There is an avalanche of candidates looking for roles, but it is your job to ensure that your brand is attracting the right people – the ones who get to choose who they work for.